In the run-up to today’s meeting between Indian Prime Minister Narendra Modi and US President Barack Obama, New Delhi and Washington have taken significant steps to enhance their burgeoning military-security ties. In doing so, the Obama administration has ignored repeated warnings from Pakistan that the US’s strategic embrace of India has upset the “balance of terror” between South Asia’s nuclear-armed states. The US and India inaugurated a new “Strategic and Commercial Dialogue” at a meeting in Washington last Wednesday between US Secretary of State John Kerry, Commerce Secretary Penny Pritzker and India’s External Affairs Minister, Sushma Swaraj, plus Commerce and Industry Minister, Nirmala Sitharaman. The “Joint Statement” issued at the meeting’s conclusion claimed that, “ties between the United States and India have never been stronger.” It reaffirmed previous commitments for a five-fold increase in India-US trade, as well as the “Joint Strategic Vision for the Asia-Pacific and Indian Ocean Region” that Modi and Obama issued last January when the US president visited New Delhi. US officials view “the Vision” statement as a major diplomatic coup for the US, not least because it contains US-drafted language regarding the conflict between China and the US and its allies over the South China Sea. Last Wednesday’s “joint statement” also outlined a series of steps to further enhance Indo-US strategic ties, including multilateral cooperation with US allies. Also Wednesday, in an action clearly timed to coincide with the initial “dialogue” meeting, India’s Bharatiya Janarta Party (BJP) government announced approval of a major weapons deal with US-based Boeing. India is spending $2.5 billion to buy 22 Apache attack helicopters and 15 Chinook heavy-lift helicopters. The Apaches and Chinooks were selected in preference to Russian-made helicopters. Their purchase is a major step towards the US displacing Russia as India’s principal arms supplier. According to Reuters, the Chinooks will be used to strengthen India’s military capabilities along its contested border with China. Issued under Kerry’s and Swaraj’s signatures, the “Joint Statement” lauded India’s decision to invite Japan to participate in “Malabar,” the annual bilateral Indo-US Indian Ocean naval exercise. Japan participated in the 2007 Malabar exercise, but after China objected strenuously, India’s government did not repeat the invitation till this summer. The US has been pressing New Delhi to join tri- and quadrilateral military-security exercises and planning with its principal Asia-Pacific allies, Japan and Australia. 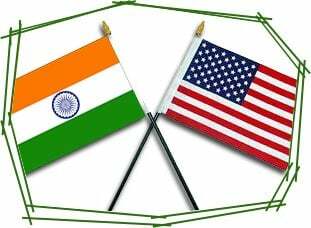 The statement issued Wednesday, announced that for the first time ever the Indian, Japanese, and US foreign ministers will hold a joint meeting. It is to be held on the sidelines of the UN General Assembly later this week. Even if initially it is being done in the name of UN peacekeeping, India’s commitment to working jointly with the US military in Africa marks a qualitative change in Indo-US strategic ties. It goes far beyond the ad hoc Indo-US cooperation seen in various disaster-relief missions since the 2004 Indian Ocean tsunami. In recent years the US has mounted a major push to expand its military capabilities in Africa, so as to offset growing Chinese influence. India also views China as a major competitor for African oil and other resources. Next month Indian Prime Minister Modi is to host a summit of African government leaders—an initiative the Indian media is openly touting as a significant step in countering Beijing. For the past decade, a central objective of US world strategy has been to transform India into a “frontline state” in its drive to strategically isolate, encircle, and if necessary wage war on China. As part of its campaign to harness New Delhi to its strategic agenda, Washington has offered New Delhi numerous blandishments and perks, including a “global strategic partnership” and pledges to support India in becoming an Indian Ocean and south-east Asian power and a permanent member of the UN Security Council. Recently the Pentagon revealed that it has established an India Rapid Reaction Cell (IRRC), the only one of its kind dedicated to a single country. According to IRCC head Keith Webster, its mission is to facilitate the expansion of India-US military ties, especially the implementation of the plans outlined in the recently negotiated Defence Trade and Technology Initiative (DTTI) to develop joint production of weapons and weapon systems. The US views control of the Indian Ocean—across which almost half of all world sea-borne trade passes—as vital to its global power and especially, in the event of open conflict, its ability to sever China’s crucial trade routes. Led by the Hindu supremacist Narendra Modi, India’s 16-month-old BJP government is seeking to leverage New Delhi’s rapidly expanding strategic partnership with Washington to pressure and bully India’s arch-rival Pakistan. Modi and his government have repeatedly spurned talks with Pakistan, demanding that it “change its behaviour” as the precondition to any resumption of the long-stalled India-Pakistan comprehensive peace dialogue. The BJP government has also instructed India’s military to assume a more aggressive posture in border skirmishes. Earlier this month, Indian and Pakistani military leaders exchanged war threats. Moreover, there continue to be frequent, often fatal, artillery exchanges across the Line of Control that separates Indian- and Pakistani-controlled Kashmir, the former princely state that is claimed by both countries. In recent weeks, Pakistani officials have issued repeated and increasingly alarmed warnings about the dangers of a full-scale military conflict. There have been two recurring themes in these warnings. First, that India is seeking to derail the recent Chinese announcement of plans to build a $46 billion economic corridor from western China to Gwadar, a Pakistani Arabian Sea port. Second, that the US’s embrace of India is dramatically tilting the strategic balance in South Asia in India’s favour and consequently forcing Pakistan to build up its military capacities. This includes both its thermonuclear arsenal and its plans to develop and deploy tactical or battlefield nuclear weapons. Aziz claimed that Pakistan has prepared a “formal dossier regarding Indian interference in Pakistan,” including the intelligence agency RAW’s support for Baluchi separatists and other “terrorist groups,” and that Islamabad plans to submit this dossier to the UN.